Former Genesis guitarist and prog legend Steve Hackett is returning with an exciting new show for a 15 date UK tour next spring after his outstanding performance at this year’s inaugural Stone Free Festival. Celebrating the 40th anniversary of the classic Genesis album Wind and Wuthering, Steve and his band will be performing several tracks from the album as well as fan favourites such as ‘The Musical Box’ and other Genesis numbers never performed before by Steve’s band such as ‘Inside & Out’ and ‘Anyway’. With an established solo career spanning over 40 years, Steve will also be performing some of his popular hits such as ‘The Steppes’, ‘Serpentine’, ‘Every Day’ and the first ever live performance of ‘Rise Again’ from his 1999 album Darktown. Steve will also be introducing fans to new music from his forthcoming album, which is due out early spring 2017. 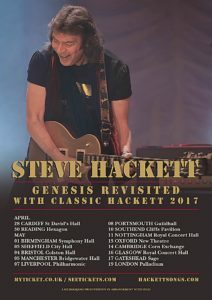 Continuing to impress with his outstanding live shows ‘Genesis Revisited with Classic Hackett’ is a tour not to missed in 2017. Tickets for UK shows go on sale on Friday 7th October at 10am from myticket.co.uk and venue box offices. Dublin tickets go onsale on the same day at 9am.